Connect with periodontal colleagues in Vancouver, British Columbia, for the American Academy of Periodontology’s (AAP’s) 104th Annual Meeting, to be held Oct. 27-30, 2018, at the Vancouver Convention Centre. The 2018 AAP Annual Meeting is being offered in collaboration with the Canadian Academy of Periodontology, the Japanese Academy of Clinical Periodontology, and the Japanese Society of Periodontology. The AAP has appointed Experient as its official housing and registration company. You must register for the meeting to secure housing. Your registration includes: Continuing education (CE) courses, admission to corporate forums, exhibits, and the Welcome Reception. Workshops, symposia, and special events require additional fees. Experient agents are available to assist with customer service needs weekdays, from 9 a.m. – 6 p.m. ET. To register and/or secure housing via mail or fax, download and fill out the printable registration and housing application. Credentials will not be mailed; please bring a valid form of ID to obtain your credentials at the meeting. Registration badges must be worn at all times during the meeting. There will be a $50 fee for replacement badges. Individual and group registration will be offered to international attendees. Individuals may use the general registration link. International groups should contact Experient at AAPgroup@experient-inc.com. Attendees must register in the appropriate category (e.g., Active Member, Non-Member Dentist), especially if CE credits will be claimed. Complete the required emergency contact information section. Accepted forms of payment include Visa, American Express, Discover, and MasterCard. Checks must be drawn on a U.S. bank in U.S. dollars and must made out to the American Academy of Periodontology and should be mailed with the completed registration form. Wire transfers are not an acceptable form of payment. 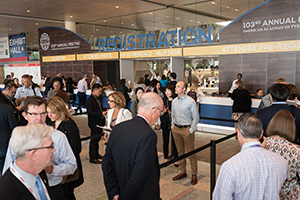 Registered spouses and guests are unable to attend CE courses, but may attend the Corporate Forums and Exhibit Hall, which are included in the spouse/guest registration fee. Registered attendees who wish to bring a spouse or guest to a ticketed event will need to purchase an additional ticket. Bring a state- or government-issued photo ID to claim registration credentials (required). Participants who do not pick up their credentials will be unable to access sessions and exhibits or claim CE credit. There is a $75 administrative fee for registration cancellations made before Sept. 19, 2018. No refunds will be issued for cancellations received after that date. PLEASE NOTE! All registration fees and fees for ticketed sessions are charged in U.S. dollars. All housing fees for the official AAP hotels will be charged in Canadian dollars. Visit the Canada Travel Information page for full details. Contact the AAP at 312-787-5518 or meetings@perio.org.